Governments around the world are increasingly using detention as a migration management tool, with refugees, asylum seekers and migrants detained for prolonged periods. However, there are humane and cost effective mechanisms that prevent unnecessary and damaging detention and that ensure detention is only ever used as a last resort. In fact, the IDC has identified more than 250 examples of alternatives to detention in over 60 countries. 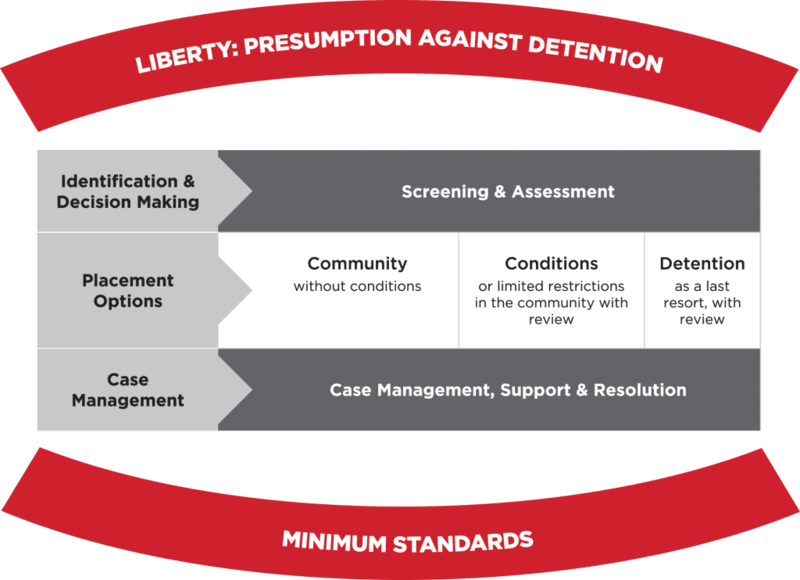 Over the past 5 years, the IDC has undertaken a program of research to identify and describe alternatives to detention, and to provide the guidance needed to successfully avoid unnecessary detention and to ensure community options are as effective as possible. The results of this research have been compiled in the Revised Handbook There are alternatives. The Revised Handbook also introduces the Revised Community Assessment and Placement (CAP) model, a strengths-based framework for implementing alternatives to detention. Liberty can be established by adopting laws, policies and practices that establish a presumption of liberty; provide a mandate to apply alternatives in the first instance; only permit detention when alternatives cannot be applied; or prohibit the detention of vulnerable individuals. Minimum Standards can be established through respect for fundamental rights; meeting basic needs; legal status and documentation; legal advice and interpretation; fair and timely case resolution; and regular review of placement decisions. Identification and Decision Making enables screening and ongoing assessment of key areas including legal obligations; identity, health and security checks; vulnerability; individual case factors; and community context. Case Management ensures a coordinated and comprehensive approach to support each case to reach case resolution. Case management builds on an individual’s strengths, identifies vulnerability or protection concerns, and addresses needs as able to assist fair and timely case resolution. Placement Options prioritises placement in the community without conditions – or with liberty – in the majority of cases. If necessary, conditions such as monitoring, supervision and surety may be applied. Finally, immigration detention may be used as a last resort in exceptional cases, provided the standards of necessity, reasonableness and proportionality have been met. The revised CAP model is a tool for governments, civil society and other stakeholders to build systems that ensure detention is only used as a last resort and that community options result in optimal outcomes. Across the 5 areas identified above, the key processes necessary for cost effective, reliable, and humane alternatives to detention to be implemented are demonstrated. The IDC can provide support and make connections on a national, regional and international level. The policies described in this handbook, as outlined in the Revised CAP model, are currently being implemented in a range of countries to enforce immigration law through mechanisms that do not rely heavily on detention. 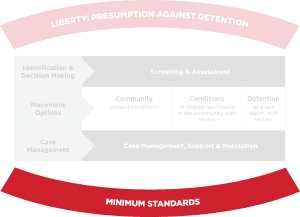 View or download the handbook on preventing unnecessary immigration detention.